After a few months of relaxing from the blogging world, finishing my Master's degree in TESOL, and a crazy teaching schedule in San Diego I have returned to the blogger world! I am excited to take on yet another contract teaching abroad on the tiny tropical island of Macau, China. Here I come Las Vegas of Asia! I was recently hired as a visiting instructor at The University of Macau where I will be teaching ESL full time and conducting research within the English Language Centre. For those of you who are not familiar with Macau, it is a small island of about 12 square miles in the South of China. Many people may know the nearby island of Hong Kong which is an ex British colony and Special Administrative Region of China with its own rules and governing system. 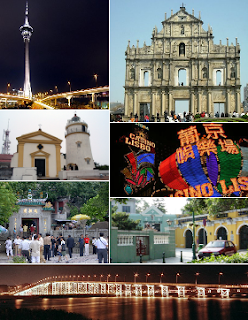 Macau is the same scenario as Hong Kong with its own rules as it was returned to China from the Portuguese in 1999. I have had some readers contact me asking why I haven't returned to teach in Korea or Japan and my reasoning is because I like to have as many experiences as possible. I am one of those people who can make a home very easily in almost any place, thus I like to keep forcing myself outside of my comfort zone and learning how to better serve my diverse populations of students. There is no better way to do so than by living in their countries and learning their cultural nuances and language tendencies first hand. Through my masters program I discovered a passion for research in ESL and The University of Macau seemed like a great fit for my future goals. I will be updating about Macau regularly and invite you to follow along! Gone Seoul Searching began in Seoul, South Korea in 2010 where I began teaching adult ESL at YBM in Jongno and continued with updates from Tokyo, Japan in 2011 where I wrote about my time in the Westgate University Program. Since 2010, I have worked at 5 ESL schools and have traveled to 10 countries including Korea, China, Taiwan, Japan, Indonesia, Thailand, Cambodia, Vietnam, Australia, and Mexico. I have also completed a Masters Degree in TESOL at the University of San Diego. My posts are focused on my travels and experiences teaching ESL abroad and within the U.S. with hopes that my readers can learn and connect in our globalized society. Gone Seoul Searching is currently living and working in Macau, China. I have a friend working there now. Sean is his name. He keeps telling me I should apply there and leave Korea. If you dont mind me asking why did you only sign a one year contract instead of a three year one? I sit right next to Sean in the office! I just received my Masters in 2012 and needed one more year of experience in higher education before applying for a senior instructor position. Also, I was working 3 jobs in the U.S. teaching ESL at various schools and community colleges. So I was burnt out and wanted a bit of a break from full-time teaching since I was teaching and making my own curriculum for 30 hours of classes a week.